Buying your first kegerator is guaranteed to change the way you enjoy beer at home. While it’s exciting to have a full keg of your favorite beer on tap whenever you want it, after a while, you may realize that many amazing beers are available in 5-gallon kegs, and that you can fit multiple 5-gallon kegs in your unit. After you’ve opened your mind to the possibility of keeping a variety of delicious beers on tap at all times, it won’t be long before you’re looking for the best solution to turn the good single tap kegerator your already own into a great multi-tap kegerator. Read on for three ways to take your beer dispensing to the next level, and let us help you find the answer that works best with your budget and technical know-how! For thrifty do-it-yourself beer lovers, individually selecting the components you’ll need to convert your single tap kegerator into a multi-tap kegerator is the most affordable solution – and can often be the most fun! It will require some extra planning, some basic technical knowledge, and some research into what specifications you want each part to have, but at the end of the process you’ll have the satisfaction of knowing that each piece has been personally chosen to fit your needs. You will need to purchase a new multi-faucet tower, and for each additional tap that you are setting up, you will need a faucet, coupler, air line, beer line, and hose clamps. You will also need to decide whether you will be dispensing your kegs at the same pressure or at different pressures simultaneously. If you will be dispensing them at the same pressure, you will need to upgrade to a dual product regulator or add an air distributor to your existing regulator. If you will be dispensing the kegs at different pressures, you will need to purchase a secondary regulator to add to your existing regulator, allowing you to control the pressure to each keg individually. Conversely, If you do not wish to purchase a new tower, or if your kegerator is installed in a way that makes swapping out the towers difficult or impossible, another option is to purchase a tower adapter. Some adapters come with all of the necessary fittings while others do not, so be aware that you may need to purchase additional parts. 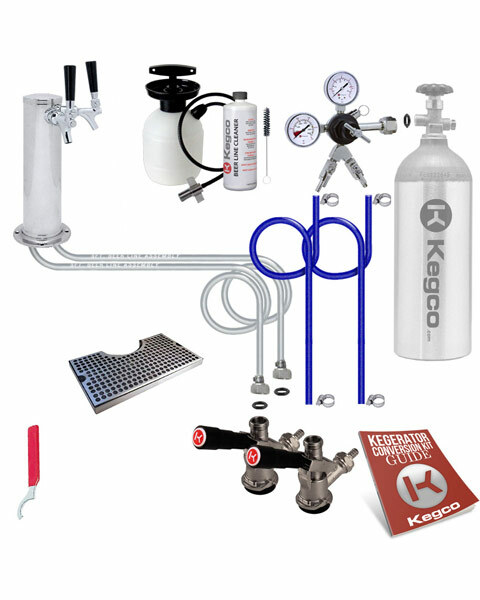 The quickest (and often the easiest) way to turn your single tap kegerator into a multi-tap kegerator is to purchase a ready-made conversion kit that includes helpful instructions and all of the components that you will need, eliminating the risk of forgetting vital parts or not understanding how they fit together. Some kegerator brands do not use industry standard fittings, making it difficult or impossible to connect your old components to your new components, so buying a full kit ensures that every piece you need will work perfectly together. One drawback to using a ready-made conversion kit is that they can be more expensive than purchasing the necessary components individually, and the kit will likely include some beer parts that you already own. However, because many first-time kegerator buyers purchase entry-level equipment, this can be a great opportunity to upgrade those beer parts to the new, higher-quality beer parts that come with the kit. While the above options are great solutions for kegerator owners that just want to get more out of an appliance they still love, for others the best option may be to sell their existing kegerator and trade up to one with a multi-tap dispense system already included. This eliminates the hassle of buying new parts and the risk of voiding a manufacturer’s warranty by installing them, and may be the only option if your existing kegerator is unable to hold the number of kegs that you need it to. The cost difference between your old single tap model and a brand new multi-tap unit might seem like more of an investment than you are ready to make. However, when most of us are purchasing our first kegerator, we choose an entry-level model with basic components to keep the initial cost low, especially if we are unsure how much use we are actually going to get out of it. If you’ve found that you love the convenience of a home kegerator and have been getting plenty of use out of it, spending the extra money for a better quality model will be an excellent investment for beers to come. No matter which solution you choose, Beverage Factory has the parts and the people to help you get it done. 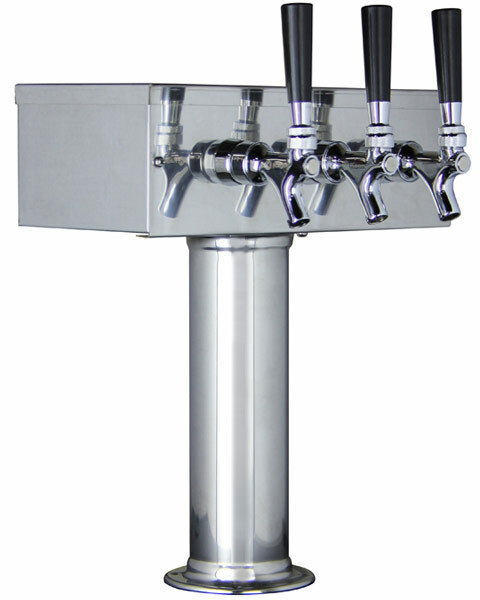 Shop our wide variety of draft dispense components and high-quality kegerators, and feel free to contact us at 800-710-9939 with any questions you may have. Draft Beer Conversion, Multi-Tap, Single Tap. permalink. Thanks for your guide this will help me to decide which keg kit will helpful for me. What are the options for converting a 2-1/2” single tap tower to a two tap tower on a Kegco Kegerator. 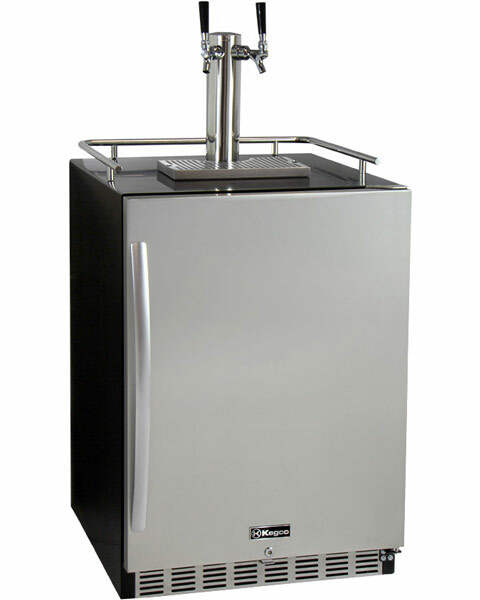 Kegco kegerators are designed to work with 3” diameter towers, so there should not be a 2-1/2” tower on any of our models. If you have a 2-1/2” tower and want to upgrade to a 3” diameter, there will need to be new holes to attach the tower flange to the top of the unit. If your unit has a wood top with vinyl laminate (some other models like Sanyo and Haier do), then you can just use self-starting wood screws to attach the tower to the kegerator. If it is metal, you may be able to drill new holes to anchor the tower to the top of the kegerator. If it is plastic, then you may have to drill all the way through the kegerator top and use long screws with nuts on the underside to fasten the tower in place, because the plastic will not be strong enough to anchor the tower. You may also try to build some sort of adapter to screw into the existing holes for the 2-1/2” tower while allowing you to attach the 2” diameter tower to the adapter.